Enjoy a magnificent experience in upper Egypt joining a private Egyptologist tour guide for one day tour from Safaga to Luxor to discover Luxor tourist attractions, in addition to exploring treasures of Ancient Egyptian Pharaohs by visiting most famous archaeological sites like Valley of the Kings, Karnak Temples, Hatshepsut temple and Colossi of Memnon, then we drive you back to Safaga Port. Book Now! Pick up services from Safaga port to Luxor & return. No site in Egypt is more impressive than Karnak temple. It is the largest temple complex ever built by man. It represents the combined achievement of many generations of ancient builders and Pharaohs. The Temple of Karnak is actually three main temples situated on 247 acres of land. Finally, we will transfer you back to Safaga Port to end your day tour from Safaga to Luxor. Took the Full Day Trip from Safaga to Luxor, Karnak, Valley of the Kings. Our guide Nermine was terrific. Her English was perfect and she really knew everything about the places we visited. All of the logistical arrangements went well too. We were collected from our cruise ship on time and had a very comfortable Toyota for the long trip to Luxor and the rest of the day. Happy to recommend Egypt Tours Portal and Nermine. Our guide Galal was very attentive and knew to answer any question. He and the driver as well were very punctual and reliable. We really spent a very good time in Luxor and fully recommend it. Our guide Galal was very attentive and knew to answer any question. He and the driver as well were very punctual and reliable. We really spent a very good time in Luxor and fully recommend it. Thanks again for the unforgettable experience!!!! Our ship was in Safaga Port for one day and we booked a private tour through Viator with Egypt Tours Portal. This was a fabulous way to cover such a long distance and so much including highlights in Luxor, Valley of Kings and a short Nile cruise to lunch venue.We were free to set our own pace with both driver and guide and completed the day much quicker and with greater comfort than bus tours. Our driver was courteous and helpful stopping for photo stops whenever. We enjoyed his company and his car was very comfortable. Our guide was picked up in Luxor and was very knowledgeable and explained so much to us in clear English. We nominated where we wanted to visit in Valley of the Kings. 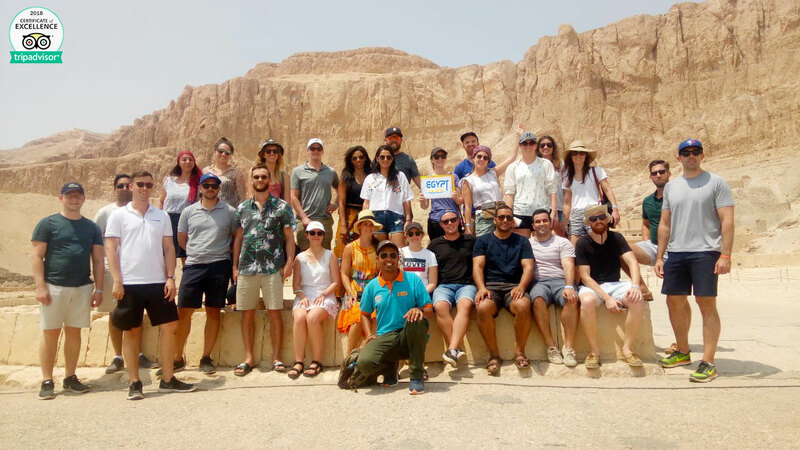 Initially we expected this shore excursion to be exhausting, but doing it as a private tour with Egypt Tours Portal made it so easy for us and the cost was most reasonable. We arrived at the Safaga Port this morning and were taken to Luxor where we met our guide for the day, Nermeen. She was extremely knowledgeable and spoke perfect English. It was our absolute pleasure to spend the day with her. Meena, thank you for such a special day! Our driver was superb too! Very polite young man and smooth driver. My friend and I had a wonderful time touring Luxor. Our tour guide, Ayman Abdou, was very knowledgeable and informative. He was practically a walking encyclopedia and was able to answer all of our questions and made the tour very engaging and exciting. Both he and our driver were very hospitable and always made sure that we were comfortable. Not to mention, my friend and I both felt very safe in Egypt. Although we heard news about the Egypt being dangerous, police and security were tight, which was comforting for both of us. The Egyptian people were all so welcoming and lovely, and we honestly couldn’t have asked for a better experience in Luxor – we’ll definitely be back again! it was lovely and fabulous day. We liked everythings from the guide to the food. The river both to reach the restaurant(Aladin Island) was wonderful experience. The guide Sam is very polite and your knowledge about the history Egpty is fabulous him took us to the best temples to see and explain everything for sure We ll come back Egpty is safe place and the peoples are Kind and Happy. We love Egypt !! Thank you Egpty!!! We had a great time on our tour of Luxor. Our very knowledgeable tour guide Mohammed Hasan showed us around the city and accompanied us to all the ruins, tombs, and temples. He was very honest and attentive. Our driver for the day was also very pleasant. We had an amazing Egyptian meal with a view of the Nile. Had an amazing time. I recommend it and I will be back. When we booked this trip Ahmed recommended we should ask for breakfast boxes from the hotel which was a great idea and not something we would have thought of ourselves. We got picked up on time at 5.30am and the driver was very friendly and the car very comfortable. When we arrived in Luxor we meet Ash our Egyptologist and he explained to us how the day will be spend. Ash was very friendly and looked after us well, getting us water when needed. We could not have asked for a better guy!!!! He had a vast knowledge and was able to answer all of our questions. We visited the Valley of the Kings, Hatshepsut temple and Karnak. We had a nice lunch at a river view restaurant and a boat trip. We was on a daytrip to Luxor. Very nice driver and the guide that we had in Luxor was just the best!! It didn´t matter what we asked,he could answer to everything!! Amasing!! Easy… I got in touch with Ahmad via e-mail from home, wonderful man and he really did everything that we might have the best experience in our lives! When I called him at 22 at night, he was just happy to hear from me! I can only give 10 stars out of 10, and next time we go down to Egypt, we will make excursions with him again, NO ONE else!